Wow! What a fabulous day! It started out cool after a night of perfect sleeping weather, and the morning was absolutely gorgeous (what I like to call a Tai Chi morning, because it just screams for a group of people performing Tai Chi exercises in the sun! ), although we didn’t crawl out of bed until almost 10:00. 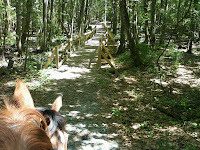 After a hearty (diet) breakfast of two eggs, toast and bacon, we saddled up and got on the trail about 12:45. What a great trail! Well marked, followed the map (although the Pink trail is new, so the woman at the ranger station just penciled it in for us), wandering through absolutely spectacular Southern forest. 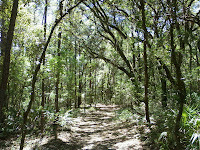 It was a mix of deciduous trees like sassafras, sub-tropical scrub palms, an occasional cacti, and pine trees so tall they were well above 100-150 feet over our heads. 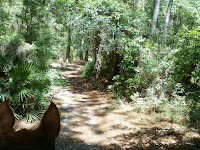 Saw a deer or two, and a turtle crossed the trail in front of us at one point as well. 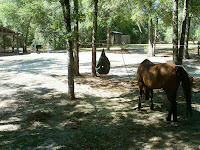 The footing was perfect, hard sand, some with a layer of pine needles, no rocks of any kind. 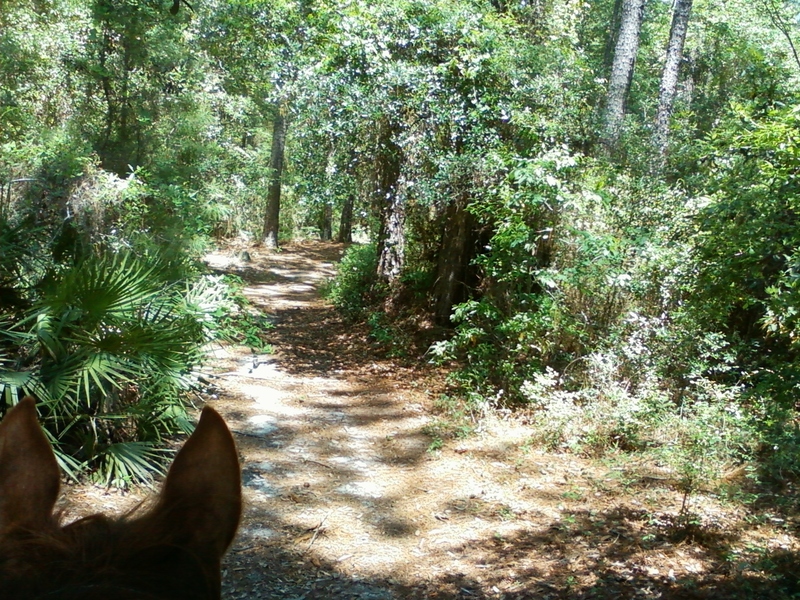 At a walk we enjoyed the utter beauty of the trail, at trots we enjoyed the great footing, and at canters (and yes, even a gallop at one point), the horses seemed to enjoy the ride as much as we did. A fantastic ride all around! We took the orange River trail all the way to the end and back, about 10 miles round trip, and were gone a bit less than three hours. Wonderful day, exactly the kind of day we live for! Woke up to rainy weather, which we had been expecting, as a line of storms has been crossing the country for some time. By the end of the day, more than 250 people had been killed as a result of the weather! Nothing we got here was anywhere near as bad, thank goodness. Spent the rainy day getting caught up on office work, then took a short trip to the Post Office in Douglas to drop off some mail. Horses were taken in and out of the trailer several times during the day, to keep them safe during the more severe storms. Finally saw a bit of sunshine trying to break through around 5:00, and the forecast is promising a perfect sunny, mild day tomorrow, which we intend to make the most of on the trail! Had a good night sleep, as it cooled off reasonably well overnight. Since it was going to be a short trip today, we had breakfast in the RV before we left. I also did some necessary business computer work since we had the time, so we ended up leaving a bit after 11:00. 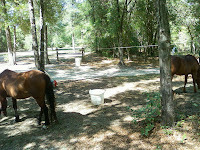 We arrived at General Coffee State Park near Douglas, GA, where we were met with some very nice hospitality (as you would expect here in the south), and we were soon settled into a spot in their newly-designated horse camp. It’s really only four campsites next to a picnic pavilion, with an open field nearby, none of which are really suitable for a satellite dish, all on a pretty significant slope. 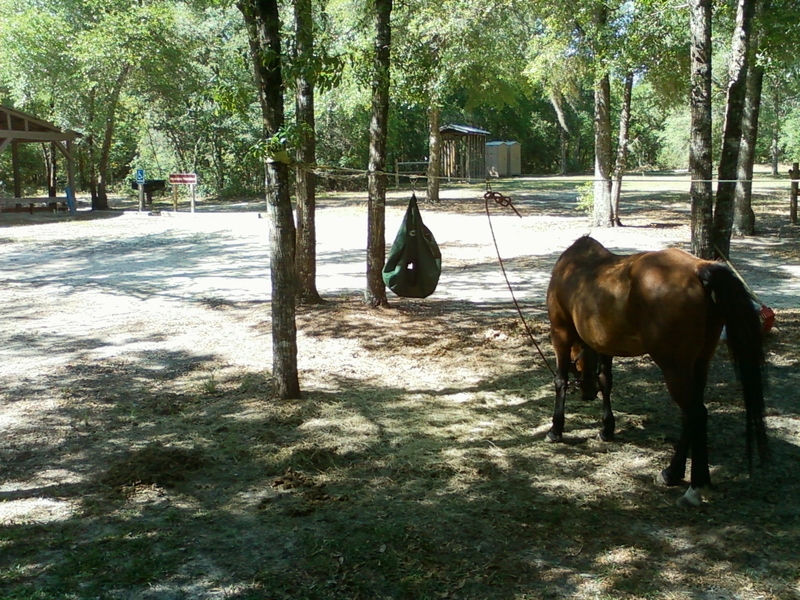 We ended up pulling sideways into Site 1 in order to get reasonably level, and soon had the horses highlined and were settled in with the A/C running (the first time we’ve had 30 amp electric to run it), enjoying a couple of movies during the evening before opening the windows up and heading off to bed. Set the alarm for 7:30, managed to be up and around by 8:00, and packed up and ready to go by just after 9:00. Said our good-byes to Brother, and headed on up the road. Stopped at the Flying J in Ft. Pierce and dumped (first time we had to actually pay for it, a phenomenon that started when Pilot bought them out), then went in for a sit-down breakfast at what is now Denny’s (used to be the Country Market), then headed north again. 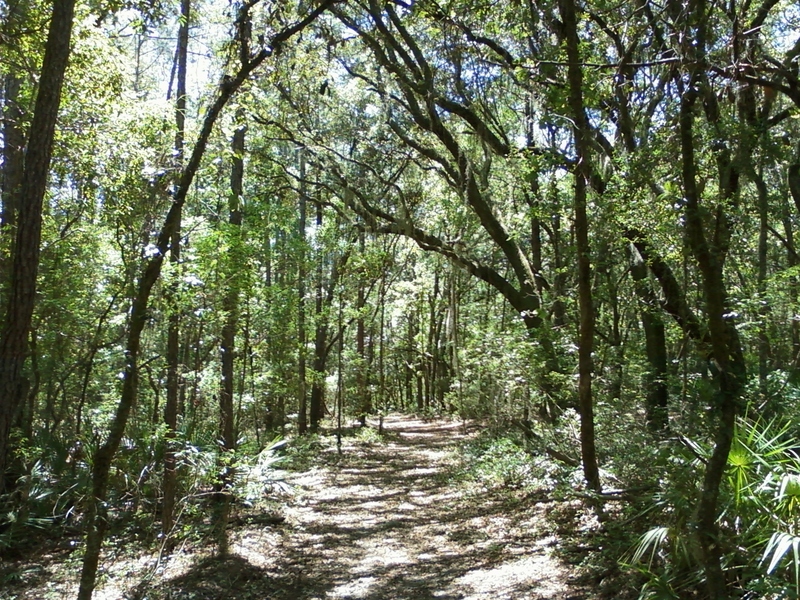 Our original plan was to stop at Tiger Bay, but we left so early and made such good time, and it was so hot outside, that we decided to get as far north as we could, so we changed our aim to Cary State Forest just west of Jacksonville, a gem of a spot where we stayed last year for nearly two weeks. 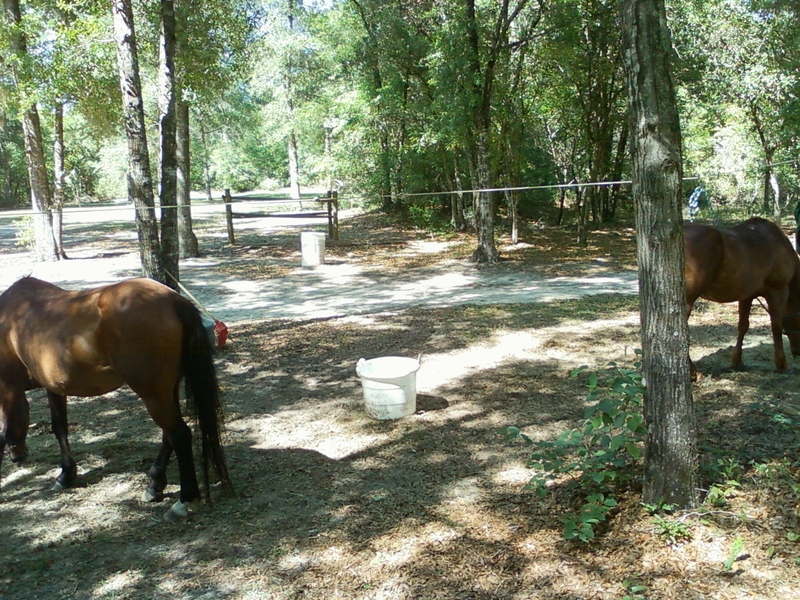 Our favorite spot at the old homeside was no longer available, so we parked in another spot next to the fire tower, highlined the horses and were all settled in by just after 5:00. Still hot here, but at least we’re moving north! As promised, the day was used to get all the last minute items done. Brother’s hired help made short work of us moving the hay over the pickup. We managed to use enough hay since our last purchase so that only three bales had to be put on the extra top level, and the straps were long enough to handle the load, no worries. Around 3:00 we headed out to a local restaurant that was supposed to have Wi-Fi so that I could instruct Brother in some internet lessons (he hasn’t used a computer in years, and that one was obsolete when it was given to him. Not so with this one, it’s practically new! ), and I showed him some of the basics, starting with how to read the instructions I’ve typed up for him. I even started him a Facebook page, and he was stunned to discover I could take his picture from the tiny camera and post it online then and there. I showed him another Brother’s Facebook page, and he was surprised to find our Christmas pix there. It’s a whole new world that he hasn’t had any idea was out there, I’m hoping he’ll find something new to do besides work all the time. We’ll see! Meanwhile, we’re looking forward to getting on the road again. We’ve had a great stay here, and we’ve managed to get a lot done, but the horses are getting bored with the terrain, and we’re looking forward to getting into the mountains, or at least some hills. It’s so flat here, it gets rather monotonous, and the weather’s starting to get WAY too hot and humid. Ready to roll! After spending the last few days resting and getting ready to leave, my brother and I enjoyed our last ride of the season together. The horse trailer is still full of hay (we’re slated to move it over to the back of the pickup tomorrow, when he has some help coming in to do some other chores around the house), so we opted to just ride around the neighborhood. This time, though, Brother wanted to go across the street to a wilderness area that he used to ride in back when he had horses. The weather was warm, but not as hot as it has been, and there was a nice, albeit warm, breeze that helped keep it from being stifling. 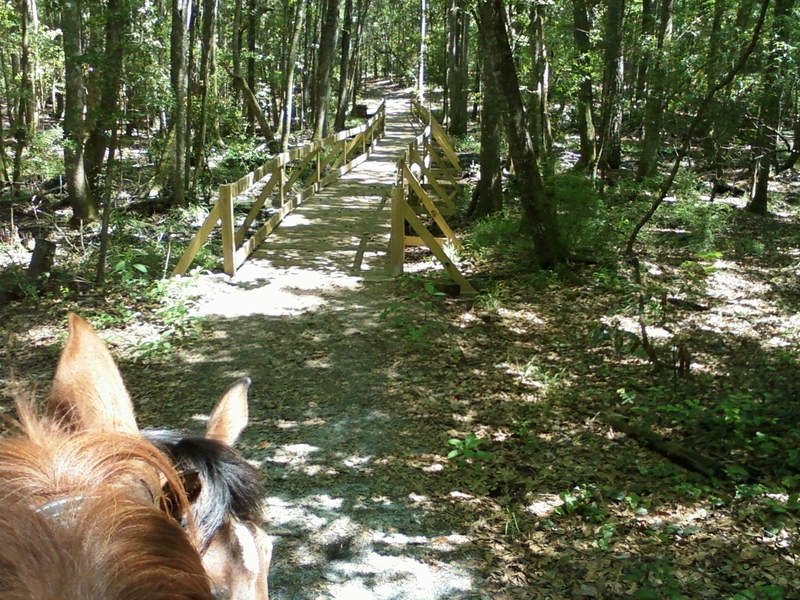 After leading the horses across the busy road, we discovered the area he used to ride in was fenced in now, but there was an actual trail sign pointing down the length of the canal, so we headed south down there. It was like a regular nature tour, where we saw lots of turtles and all kinds of birds, with a keen eye open for alligators, as it’s supposed to be mating season. Brother wasn’t sure they would be coming in this far, though, because the water levels were pretty far down because of a lengthy drought they’ve been having here. Never saw one, anyway, though we heard a baby one on the way home (at least according to him :-). Stayed out quite a bit longer than I expected, I guess he wanted to make the most out of it since it will probably be the last time he rides until we come back next year. Followed the canal back, probably 4-5 miles, before finally turning around and heading back. We stopped a few times to stretch our legs, so we ended up being out over 5 hours. We mostly walked, but on the way back he did start speeding up, we managed to get a good number of trots and canters in. A lovely ride, and a great way to end our time here. Will spend tomorrow getting ready to go, giving Brother some last minute lessons on his new/my old computer, moving hay, and generally packing up. Ready to get back on the road again! Though I woke up around 7:00 and got up around 8:00, I went back to bed about 10:00 still tired. Hubby was sound asleep straight through. We finally woke up together, with Hubby asking what time we had to check out, since the clock said it was 11:45! We leaped out of bed and started packing at once, heading out of the room just before 12:30. I got the boarding passes printed out in the lobby and we caught the 1:00 shuttle to the airport. Had a nice leisurely lunch at TGIF’s before managing to get through security, this time with no trouble whatsoever, thank heavens. We settled down for our flight, which was scheduled in another two hours, then was delayed by half an hour. The plane was filled with St. Mark’s high school kids, presumably coming back from their Spring break trip to DC, so it was rather boisterous most of the time. We left the gate even later, than were shuffled around the busy taxiways for awhile before the captain came on saying there was a technical problem and we had to go back to the gate. It didn’t take long to reset the control box, then we headed out again, finally taking off around 7:00. Arrived more than an hour late in PBI, headed straight back to the ranch, exhausted. Didn’t take long to crash, as it was past 10:00 by the time we arrived. No doubt going to sleep late tomorrow! Great day today, big turnout, excellent group, and despite by trials and short preparation time, I managed to get into the zone, and kept them all riveted until 5:30, ending a half hour later than usual, mostly because of the large crowd, but also because I felt that I had missed out on some stuff on previous Workshops and wanted to make sure I got everything in. No one seemed to mind, and in fact I received multiple kudos on my ability to be “on” for so many hours. Good day. Had dinner with our host, then back to bed for an early night! Not surprisingly, we both had a lousy night sleep, being agitated over all of the events of yesterday. In the afternoon Hubby took the shuttle over to the nearest grocery store to pick up a few things while I worked on the outline for an audio conference we’re facilitating next month. I felt exhausted most of the day, finally taking a break to watch a movie late in the afternoon, then took some time to do some prep work for our Workshop tomorrow. I was so tired that I could only stay awake for about a half hour before I dozed off. Just as well, I need a good night sleep for our early, busy day tomorrow!